Do you sometimes wonder if banks are on the same planet as the rest of us?! Small business owners work every hour they can and yet when they need to do essential banking that requires a visit to a branch the hours are usually 9:00-17:00! Yet recent research by Funding Xchange has found that 42% of UK small businesses apply for funding such as small business loans outside of traditional banking hours. So is this a problem? These days most of us do most things online and small business funding is no exception. The research - based on a sample of 1,000 small business loan applications - found that the hours between 5pm and 9pm are the most popular (22%) for small business funding online activity, followed by 9pm and midnight (8%), and early morning before 9am (7%). However, whatever the time that the activity is initiated, there is likely to come a time when you are asked to “pop into the branch” ie between 9 and 5! The upshot of this is that many small business owners are looking elsewhere for small business funding with more accessible hours, which could cause mainstream lenders to miss out on some potential business. So if you are in the position of seeking small business funding but need to find a lender who is accessible when you need them to be, what should you look for? One of the main things would be to find a lender who will provide you with a dedicated relationship manager. You do not have the time to deal with different people each time you phone your lender, and have to explain your situation and your needs several times over! At Fair Business Loans your relationship manager will be with you from start to finish and when you apply for a small business loan will come and visit you and your business - at your premises and at a time to suit you - to get to know your business in person and gain a real understanding of your needs. 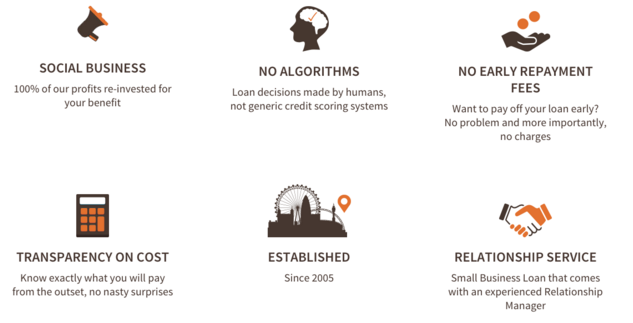 The image below highlights the other factors that we would urge you to look for in a potential lender and on which we pride ourselves at Fair Business Loans. But don’t just take our word for it! Why not browse through our case studies to see how people like you - and businesses like yours - have obtained the small business funding they need from us and have used it to grow and develop their business. If you would like to discuss your small business funding needs with us then do get in touch and we will do our best to help you at a time that fits with your business needs!